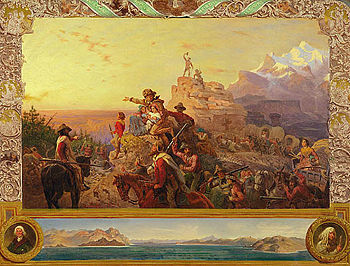 This painting (circa 1872) by John Gast called American Progress is an allegorical representation of Manifest Destiny. In the scene, an angelic woman (sometimes identified as Columbia, a nineteenth-century personification of the United States) carries the light of "civilization" westward with American settlers, stringing telegraph wire as she travels. American Indians, buffalos and wild animals are driven into the darkness before them. Manifest Destiny is a nineteenth-century belief that the United States had a mission to expand westward across the North American continent, spreading its form of democracy, freedom, and culture. The expansion was deemed to be not only good, but also obvious ("manifest") and certain ("destiny"). Many believed the mission to be divinely inspired while others felt it more as an altruistic right to expand the territory of liberty. Originally a political catch phrase of the nineteenth century, Manifest Destiny eventually became a standard historical term, often used as a synonym for the territorial expansion of the United States across North America. A general notion rather than a specific policy, Manifest Destiny comprised not only a mandate for territorial expansionism, but also notions of individualism, idealism, American Exceptionalism, Romantic nationalism, White supremacism, and a belief in the inherent greatness of what was then called the "Anglo-Saxon race." Although the phrase defies precise definition, the components all tend to share the mindset that presumed the indigenous peoples to be primitive "others" whose lifestyle and thinking required that they be socialized, segregated, or, if necessary, destroyed, while the Anglo-Saxons occupied the land and harnessed it to useful purposes such as agriculture. Manifest Destiny was both an explanation or justification for the territorial expansion of the United States and the westward migration of settlers to the American frontier, and an ideology or doctrine that helped promote the process. This article addresses the history of the idea of Manifest Destiny and the influence of that idea upon American expansion. 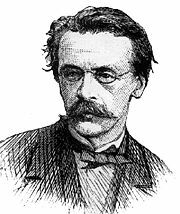 The phrase was coined in 1844 by New York journalist John L. O'Sullivan, then an influential advocate for the Democratic Party. 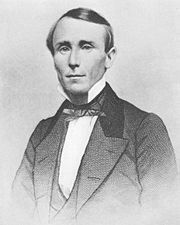 In an essay titled “"Annexation” and published in the Democratic Review, O'Sullivan urged the United States to annex the Republic of Texas, not only because Texas desired this, but because it was America's "manifest destiny to overspread the continent allotted by Providence for the free development of our yearly multiplying millions." Texas became a U.S. state shortly thereafter, but O'Sullivan's first usage of the phrase "Manifest Destiny" attracted little attention. 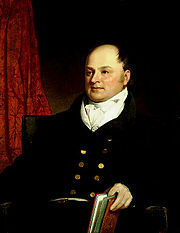 O'Sullivan believed that God ("Providence") had given the United States a mission to spread republican democracy ("the great experiment of liberty") throughout North America. Because Great Britain would not use Oregon for the purposes of spreading democracy, argued O'Sullivan, British claims to the territory could be disregarded. O'Sullivan believed that Manifest Destiny was a moral ideal (a "higher law") superseding other considerations, including international laws and agreements. O'Sullivan's original conception of Manifest Destiny was not a call for territorial expansion by force. He believed that the expansion of U.S.-style democracy was inevitable, and would happen without military involvement as whites (or "Anglo-Saxons") immigrated to new regions. O'Sullivan disapproved of the outbreak of the Mexican-American War in 1846, although he came to believe that the outcome would be beneficial to both countries. At first, O'Sullivan was not aware that he had created a new catch phrase. The term became popular after it was criticized by Whig opponents of the Polk administration. On January 3, 1846, Representative Robert Winthrop ridiculed the concept in Congress, saying "I suppose the right of a manifest destiny to spread will not be admitted to exist in any nation except the universal Yankee nation." Winthrop was the first in a long line of critics who suggested that advocates of Manifest Destiny were citing "Divine Providence" for justification of actions that were motivated by more earthly interests. Despite this criticism, Democrats embraced the phrase. It caught on so quickly that it was eventually forgotten that O'Sullivan had coined it. O'Sullivan died in obscurity in 1895, just as his phrase was being revived; it was not until 1927 that a historian determined that the phrase had originated with him. the destiny under God to accomplish this work. We have it in our power to begin the world over again. A situation, similar to the present, hath not happened since the days of Noah until now. The birthday of a new world is at hand…. Many Americans agreed with Paine, and came to believe that the United States had embarked upon a special experiment of world-historical importance, a rejection of Old World monarchy in favor of freedom and democracy. President Abraham Lincoln's later description of the United States as "the last, best hope of Earth" is a well-known expression of this idea. Lincoln's Gettysburg Address, in which he interpreted the Civil War as a struggle to determine if any nation with America's ideals could survive, has been called by historian Robert Johannsen "the most enduring statement of America's Manifest Destiny and mission." The belief that the United States had a mission to spread its institutions and ideals through territorial expansion—what Andrew Jackson in 1843 famously described as "extending the area of freedom"—was a fundamental aspect of Manifest Destiny. Many believed that American-style democracy would spread without any effort by the United States government. American pioneers would take their beliefs with them throughout North America, and other countries in the world would seek to emulate American institutions. Thomas Jefferson initially did not believe it necessary that the United States itself should expand, since he believed that other republics similar to the United States would be founded in North America, forming what he called an "empire for liberty." With the Louisiana Purchase in 1803, however, he embraced expansion. As more territory was added to the United States in the following decades, whether or not "extending the area of freedom" also meant extending the area of slavery became a central issue in a growing divide over the interpretation of America's "mission." The phrase "Manifest Destiny" is most often associated with the territorial expansion of the United States from 1815 to 1860. This era, from the end of the War of 1812 to the beginning of the American Civil War, has been called the "Age of Manifest Destiny." During this time, the United States expanded to the Pacific Ocean—"from sea to shining sea"—largely defining the borders of the continental United States as they are today. Manifest Destiny played a role in U.S. relations with British North America (later Canada) to the north, but was more consequential in relations with Mexico and the outbreak of the Mexican-American War. The pervasive racialism of Manifest Destiny had serious consequences for American Indians. Adams did much to further this idea. He orchestrated the Treaty of 1818, which established the United States-Canada border as far west as the Rocky Mountains, and provided for the joint occupation of the Oregon Country. He negotiated the Transcontinental Treaty in 1819, purchasing Florida from Spain and extending the U.S. border with Spanish Mexico all the way to the Pacific Ocean. Adams also formulated the Monroe Doctrine of 1823, which warned Europe that the Western Hemisphere was no longer open for European colonization. With this the U.S. conceptually and rhetorically annexed the whole of the Western Hemisphere into its sphere of influence. The Monroe Doctrine and Manifest Destiny were closely related ideas; historian Walter McDougall calls Manifest Destiny a "corollary" of the Monroe Doctrine, because while the Monroe Doctrine did not specify expansion, the sense of Manifest Destiny implicitly nurtured the national will to enforce the Doctrine, which was driven by concerns in the United States that European powers (especially Great Britain) were seeking to increase their influence in North America. In his influential 1935 study of Manifest Destiny, Albert Weinberg wrote, "the expansionism of the 1840s arose as a defensive effort to forestall the encroachment of Europe in North America." On the northern border of the United States, Manifest Destiny played its most important role in the Oregon Country border dispute with Great Britain. The Anglo-American Convention of 1818 had provided for the joint occupation of the region, which included much of present-day Oregon and Washington states in the U.S. and the southern part of today's province of British Columbia in Canada; Americans migrated there in the 1840s over the Oregon Trail. The British refused a proposal by President John Tyler to divide the region along 49th parallel (an offer made earlier by John Quincy Adams), instead proposing a boundary line further south along the Columbia River. Advocates of Manifest Destiny protested, and called for the annexation of the entire Oregon Country. Presidential candidate James K. Polk used this popular outcry to his advantage, embracing the slogan Fifty-Four Forty or Fight! (referring to the latitude of the northern border of the region) in the U.S. Presidential election. The Whig candidate Henry Clay, misjudging popular sentiment, spoke against annexing any part of Canada or Texas, which some historians believe cost him the election. American westward expansion is idealized in Emanuel Leutze's famous painting Westward the Course of Empire Takes its Way (1861). The title of the painting, from a 1726 poem by Bishop Berkeley, was a phrase often quoted in the era of Manifest Destiny, expressing a widely held belief that civilization had steadily moved westward throughout history. The dispute was settled diplomatically with the Oregon Treaty of 1846, setting the border at the 49th parallel, the original U.S. proposal. Despite the earlier clamor for "all of Oregon," the treaty was popular in the U.S. and was easily ratified by the Senate. Many Americans believed that the Canadian provinces would eventually merge with the United States, and that war was unnecessary, even counterproductive in fulfilling that destiny. The most fervent advocates of Manifest Destiny had not prevailed along the northern border because, according to Reginald Stuart, "the compass of Manifest Destiny pointed west and southwest, not north, despite the use of the term 'continentalism.'" After the election of Polk, but before he took office, Congress approved the annexation of Texas. Polk moved to occupy a portion of Texas that was also claimed by Mexico, paving the way for the outbreak of the Mexican-American War on April 24, 1846. With American successes on the battlefield, by the summer of 1847 there were calls for the annexation of "All Mexico," particularly among Eastern Democrats, who argued that bringing Mexico into the Union was the best way to ensure future peace in the region. [W]e have never dreamt of incorporating into our Union any but the Caucasian race—the free white race. To incorporate Mexico, would be the very first instance of the kind, of incorporating an Indian race; for more than half of the Mexicans are Indians, and the other is composed chiefly of mixed tribes. I protest against such a union as that! Ours, sir, is the Government of a white race.... We are anxious to force free government on all; and I see that it has been urged … that it is the mission of this country to spread civil and religious liberty over all the world, and especially over this continent. It is a great mistake. This debate brought to the forefront one of the contradictions of Manifest Destiny: on the one hand, while racist ideas inherent in Manifest Destiny suggested that Mexicans, as non-Anglo-Saxons, were a lesser race and thus not qualified to become Americans, the "mission" component of Manifest Destiny suggested that Mexicans would be improved (or "regenerated," as it was then described) by bringing them into American democracy. Racism was used to promote Manifest Destiny, but, as in the case of Calhoun and the resistance to the "All Mexico" movement, racism was also used to oppose Manifest Destiny. The Mexican Cession eventually ended the controversy, which added the territories of California and New Mexico to the United States, both more sparsely populated than the rest of Mexico. Like the "All Oregon" movement, the "All Mexico" movement quickly abated. Historian Frederick Merk, in Manifest Destiny and Mission in American History: A Reinterpretation (1963), argued that the failure of the "All Oregon" and "All Mexico" movements indicates that Manifest Destiny had not been as popular as historians have traditionally portrayed. Merk wrote that, while belief in the beneficent "mission" of democracy was central to American history, aggressive "continentalism" (and later, imperialism) were aberrations supported by only a very small (but influential) minority of Americans. Merk's interpretation is probably still a minority opinion; scholars generally see Manifest Destiny, at least in the 1840s, as a widely popular belief. After the Mexican-American War ended in 1848, disagreements over the expansion of slavery made further territorial annexation too divisive to be official government policy. Many Northerners were increasingly opposed to what they believed to be efforts by Southern slave owners—and their friends in the North—to expand slavery at any cost. The proposal during the war of the Wilmot Proviso (a statement declaring that slavery would not be permitted in any new territory acquired by the U.S.), and the emergence of various "Slave Power" conspiracy theories thereafter, indicated the degree to which Manifest Destiny had become controversial. Without official government support, the most radical advocates of Manifest Destiny increasingly turned to filibustering—the mounting of expeditions of unauthorized volunteer soldiers often motivated by a belief in Manifest Destiny. While there had been some filibustering expeditions into Canada in the late 1830s, the primary target of Manifest Destiny’s filibusters was Latin America, particularly Mexico and Cuba. Though illegal, the filibustering operations in the late 1840s and early 1850s were romanticized in the U.S. press. Wealthy American expansionists financed dozens of expeditions, usually based out of New Orleans. Filibuster William Walker launched several expeditions into Latin America. For a time he ruled Nicaragua, although he was eventually seized by the U.S. Navy and returned to United States. In 1860 he was captured and executed in Honduras. The United States had long been interested in acquiring Cuba from the declining Spanish Empire. Just as they earlier had been concerned that Texas, Oregon, and California would fall into British hands, American policy makers became concerned that Cuba would fall into British hands, which, according to the thinking of the Monroe Doctrine, would constitute a threat to the interests of the United States. Prompted by John L. O'Sullivan, in 1848 President Polk offered to buy Cuba from Spain for $100 million. Fearing that filibustering would hurt his effort to buy the island, Polk informed the Spanish of an attempt by the Cuban filibuster Narcisco Lopez to seize Cuba by force and annex it to the U.S., and the plot was foiled. Nevertheless, Spain declined to sell the island, which ended Polk's efforts to acquire Cuba. O'Sullivan, on the other hand, continued to raise money for filibustering expeditions, eventually landing him in legal trouble. Filibustering continued to be a major concern for presidents after Polk. Whig presidents Zachary Taylor and Millard Fillmore tried to suppress the expeditions. When the Democrats recaptured the White House in 1852 with the election of Franklin Pierce, a filibustering effort by John A. Quitman to acquire Cuba received the tentative support of the president. Pierce backed off, however, and instead renewed the offer to buy the island, this time for $130 million. When the Ostend Manifesto—a secret agreement in 1854 between the U.S. and Spain for the U.S. to buy Cuba with the proviso that the United States could seize Cuba by force if Spain refused to sell, and with further innuendos that slave-holding would be permitted in Cuba once the U.S. acquired it—was leaked to the public, strong reaction, especially by northern anti-slavery elements, effectively killed the effort to acquire the island. The public now linked expansion with slavery; if Manifest Destiny had once had widespread popular approval, it was no longer the case. Filibusters like William Walker continued to garner headlines in the late 1850s, but with the outbreak of the American Civil War in 1860, the "Age of Manifest Destiny" came to an end. Expansionism was among the various issues that played a role in the coming of the war. With the divisive question of the expansion of slavery, Northerners and Southerners, in effect, were coming to define Manifest Destiny in different ways, undermining nationalism as a unifying force. According to Frederick Merk, "The doctrine of Manifest Destiny, which in the 1840's had seemed Heaven-sent, proved to have been a bomb wrapped up in idealism." Manifest Destiny had serious consequences for American Indians, since continental expansion usually meant the occupation of Native American land. The United States continued the European practice of recognizing only limited land rights of indigenous peoples. In a policy formulated largely by Henry Knox, Secretary of War in the Washington Administration, the U.S. government sought to expand into the west only through the legal purchase of Native American land in treaties. Indians were encouraged to sell their vast tribal lands and become "civilized," which meant (among other things) for Native American men to abandon hunting and become farmers, and for their society to reorganize around the family unit rather than the clan or tribe. Advocates of "civilization" programs believed that the process would greatly reduce the amount of land needed by the Indians, thereby making more land available for purchase by white Americans. Thomas Jefferson believed that while American Indians were the intellectual equals of whites, they had to live like the whites or inevitably be pushed aside by them. Jefferson's belief, rooted in Enlightenment thinking, which held that whites and Native Americans would merge to create a single nation, did not last his lifetime. Jefferson grew to believe that the natives should emigrate across the Mississippi River and maintain a separate society, an idea made possible by the Louisiana Purchase of 1803. In the age of Manifest Destiny, this idea, which came to be known as "Indian Removal," gained ground. Although some humanitarian advocates of removal believed that American Indians would be better off moving away from whites, an increasing number of Americans regarded the natives as nothing more than "savages" who stood in the way of American expansion. As historian Reginald Horsman argued in his influential study Race and Manifest Destiny, racial rhetoric increased during the era of Manifest Destiny. Americans increasingly believed that Native Americans would fade away as the United States expanded. As an example, this idea was reflected in the work of one of America's first great historians, Francis Parkman, whose landmark book The Conspiracy of Pontiac was published in 1851. Parkman wrote that Indians were "destined to melt and vanish before the advancing waves of Anglo-American power, which now rolled westward unchecked and unopposed." As the Civil War faded into history, the term Manifest Destiny experienced a brief revival. In the 1892 U.S. presidential election, the Republican Party platform proclaimed: "We reaffirm our approval of the Monroe doctrine and believe in the achievement of the manifest destiny of the Republic in its broadest sense." What was meant by "manifest destiny" in this context was not clearly defined, particularly since the Republicans lost the election. In the presidential election of 1896, however, the Republicans recaptured the White House and held on to it for the next 16 years. During that time, Manifest Destiny was cited to promote overseas expansion. Whether or not this version of Manifest Destiny was consistent with the continental expansionism of the 1840s was debated at the time, and long afterwards. For example, when President William McKinley advocated annexation of the Territory of Hawaii in 1898, he said that "We need Hawaii as much and a good deal more than we did California. It is manifest destiny." On the other hand, former President Grover Cleveland, a Democrat who had blocked the annexation of Hawaii during his administration, wrote that McKinley's annexation of the territory was a "perversion of our national destiny." Historians continued that debate; some have interpreted the overseas expansion of the 1890s as an extension of Manifest Destiny across the Pacific Ocean; others have regarded it as the antithesis of Manifest Destiny. In 1898, after the sinking of the USS Maine in the harbor at Havana, Cuba, the United States intervened on the side of Cuban rebels who were fighting the Spanish Empire, beginning the Spanish-American War. Although advocates of Manifest Destiny in the 1840s had called for the annexation of Cuba, the Teller Amendment, passed unanimously by the U.S. Senate before the war, proclaimed Cuba "free and independent" and disclaimed any U.S. intention to annex the island. After the war, the Platt Amendment (1902) established Cuba as a virtual protectorate of the United States. If Manifest Destiny meant the outright annexation of territory, it no longer applied to Cuba, since Cuba was never annexed. On the other hand, Manifest Destiny had also contained within it the idea that "uncivilized" peoples could be improved by exposure to the Christian, democratic values of the United States. In his decision to annex the Philippines, President McKinley echoed this theme: "There was nothing left for us to do but to take them all, and to educate the Filipinos, and uplift and civilize and Christianize them…." Rudyard Kipling's poem "The White Man's Burden," which was subtitled "The United States and the Philippine Islands," was a famous expression of these sentiments, which were common at the time. Many Filipinos, however, resisted this effort to "uplift and civilize" them, resulting in the outbreak of the Philippine-American War in 1899. After the war began, William Jennings Bryan, an opponent of overseas expansion, wrote that "‘Destiny’ is not as manifest as it was a few weeks ago." After the turn of the century, the phrase Manifest Destiny declined in usage, as territorial expansion ceased to be promoted as being a part of America's "destiny." Under President Theodore Roosevelt, the role of the United States in the New World was defined, in the 1904 Roosevelt Corollary to the Monroe Doctrine, as an "international police power" to secure American interests in the Western Hemisphere. Roosevelt's corollary contained an explicit rejection of territorial expansion. In the past, Manifest Destiny had been seen as necessary to enforce the Monroe Doctrine in the Western Hemisphere, but now expansionism had been replaced by interventionism as a means of upholding the doctrine. … I think we all realize that the day has come when Democracy is being put upon its final test. The Old World is just now suffering from a wanton rejection of the principle of democracy and a substitution of the principle of autocracy as asserted in the name, but without the authority and sanction, of the multitude. This is the time of all others when Democracy should prove its purity and its spiritual power to prevail. It is surely the manifest destiny of the United States to lead in the attempt to make this spirit prevail. ↑ From Revolution to Reconstruction. . "Manifest Destiny" By Michael T. Lubragge. University of Groningen, American Studies. Retrieved December 11, 2007. ↑ Anders Stephanson. Manifest Destiny: American Expansionism and the Empire of Right examines the influence of Manifest Destiny in the 20th century. (New York: Hill and Wang. 1995), particularly as articulated by Woodrow Wilson and Ronald Reagan. ↑ Excerpt The Great Nation of Futurity. The United States Democratic Review 6 (23): 426-430. Mount Holyoke College. Retrieved May 9, 2008. ↑ Frederick Merk. 1970. Manifest Destiny and Mission in American History: A Reinterpretation. (New York: Knopf), 144-147. ↑ Calhoun quoted in Merk, 162. ↑ Walter A. McDougall. 1997. Promised Land, Crusader State: The American Encounter with the World Since 1776. (New York: Houghton Mifflin), 87–95. ↑ William Earl Weeks. 1996. Building the Continental Empire: American Expansion from the Revolution to the Civil War. (Chicago: Ivan R. Dee), 144–152. ↑ Republican Party platform UCSB. Retrieved May 9, 2008. ; context not clearly defined, Merk. 241. ↑ "antithesis" of Manifest Destiny: Merk, 257. ↑ McKinley quoted in McDougall, 112; Bryan quoted in Weinberg, 283. ↑ ”"Safe for democracy”; 1920 message Retrieved May 9, 2008. ↑ Wilson's version of Manifest Destiny: Albert K. Weinberg. 1994. Manifest Destiny: A Study of Nationalist Expansionism in American History. (Reprint Services Corp.), 471. Weinberg, Albert K. Manifest Destiny: A Study of Nationalist Expansionism in American History. Reprint Services Corp, 1994. ISBN 0781248566 Cited by many scholars. The March 1845 Inaugural Address of James K. Polk MARCH 4, 1845, The Avalon Project, Yale University. This page was last modified on 9 August 2018, at 16:15.